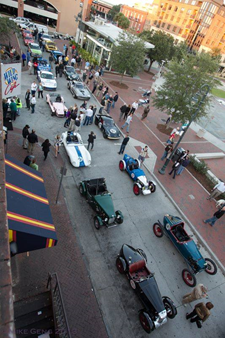 Savannah, GA Nestled across the water from the famed River Street, Savannah’s own little private island comes alive with the roar of engines October 23 – 26, 2014. The week long motoring festival starts with the pace lap party in Ellis Square Thursday, October 23rd. With its storied past and cobblestone streets, Savannah, unbeknownst to most, is the birth place of Grand Prix racing. Celebrating that heritage, the Savannah Speed Classic is a unique road race experience offering an intimate look at the inner workings of racing. Savannah, GA, thought of by most for its Southern charm, storied past and relaxing pace, is not typically linked to fast cars. American auto racing today is synonymous with cities such as Indianapolis and Daytona. However, unknown to most, the unlikely city of Savannah, GA is, in actuality, the birthplace of Grand Prix racing in America. Imagine back to 1908 – the unpaved city streets of Savannah filled with hundreds of thousands of spectators from across the United States; over 1,500 soldiers serving as human barricades to protect those watching from the racing cars zooming past; people traveling by train and steamship to be a part of the historic occasion; downtown hotels opening their ballrooms to serve as campgrounds for visitors; the greatest names from Louis Chevrolet to Henry Ford to the Vanderbilts all in attendance. From 1908 to 1911, four major automobile races were hosted in Savannah, Georgia in which automobile drivers from around the world participated in a grand prix auto racing on a twenty-five mile race course laid out southwest of the city proper. In 2008, racing was finally brought back to the city of Savannah. The Hilton Head Island Motoring Festival & Concours d’Elegance reopened the track at Hutchinson Island with the Savannah Speed Classic. HSR brings wheel to wheel racing back to its roots in Savannah. Featuring series races, enduros and even more excitement with hot lap rides, test drives, an off road experience, and pit access. The Savannah Speed Classic is a great destination for drivers, crew, family, friends and spectators alike.